After a two year hiatus due to World War I, the Speedway began racing again in 1919. In celebration of the Allied victory in WWI, the Speedway renamed the race the “Liberty Sweep Stakes”. The grandstand ticket stub remains the same size as in 1916 (2 2/5" x 2 3/4"). The general admission ticket stub is a little smaller coming in at 2 1/4" 2 2/3". The backs remain blank through 1922 on grandstand tickets and through 1928 for general admission. There is no printer listed for tickets from 1919 through 1928. The signature of "T.E.Meyers Gen. Mgr." appears at the lower right of the rain check on grandstand stubs from 1919 through 1923, as "Sect-Treas." from 1924 through 1927 and as "Vice Pres." in 1928 and '29. He also appears as "T.E.Meyers Gen. Mgr." at the lower right on general admission stubs from 1919 through 1921. General admission tickets have a serial number on them from 1919-1928. There is no price designated on the stub portion of tickets from 1919 through 1928. Note the large portion of the Complimentary ticket above states: "WAR TAX PAID 19 Cts.". It is assumed the large portion of a grandstand ticket would have had the same statement. The smaller “Complimentary” ticket above right would’ve been attached to the right side. The "Exchange Ticket" stub below has a serial number on it and there is only a perforation at left which indicates it is probably general admission. For 1920 and 1921 the grandstand ticket stubs keep the same size and configuration as 1919. The general admission ticket stubs are a little larger than 1919 at 2 1/4" x 2 3/4". "J.A. Allison Treas." appears at lower right on the large portion of the 1920 general admission ticket. Note that the 1920 Field Gate Admission (general admission) stub below right says “NGE” which indicates it is probably an “Exchange Ticket” like the 1919 above. The 1922 changes from a horizontal perforation between the rain check and stub to vertical. The 1922 grandstand also narrows to 2 1/16" but retains the same height of 2 2/5". The general admission shrinks a little to 2 1/5" x 2 2/3". The signature of "C.G. Fisher Prest." appears at the lower right corner of general admission stubs for 1922 and 1923. “General Admission” appears back on the ticket and it will remain so through 1928. For 1923, both ticket stubs retain the same perforations as 1922, but the size changes to 2 1/3" x 2 2/3" for the grandstand** and 2 1/5" x 2 4/5" for the general admission. A significant change also occurs in 1923 for the grandstand ticket in the form of a design (an updated "Wing and Wheel" logo in this case) on both the front and back of the ticket. General admission tickets remain blank through 1928. Note the 1923 general admission ticket is "Complimentary". The signature of "C.G. Fisher Prest." appears at lower right of the large portion of the grandstand ticket. The 1924 ticket stub reverts back to a horizontal perforation and the size changes to 2 1/4" x 2 2/3". The general admission ticket stub retains the same perforations but the size changes to 2 1/6" x 2 2/3". "J.A. Allison President" appears at lower right on general admission stubs from 1924 through 1927. The 1925 grandstand ticket stub picks up vertical perforations again as do 1926, '27 and '28. The size changes to 2 1/3” x 2 4/5" for 1925. For 1926 and 1927, the width changes to 2 1/2" but the height remains the same as 1925. The 1928 grandstand ticket stub comes in a little smaller at 2 2/5" x 2 3/4". The general admission ticket stub size changes to 2 1/4” x a little under 3" and remains so through 1928. Note that the 1926 general admission and one of the '28 general admissions are "Complimentary". With the change of ownership to Capt. 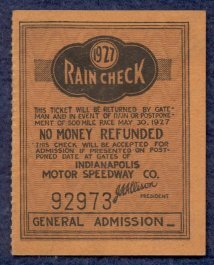 Eddie Rickenbacker in late 1927, the Speedway changed it's name from the "Indianapolis Motor Speedway Company" to "Corporation" and the 1928 ticket reflects that change. The signature of "J.A. Allison Prest." appears at lower right on the large portion of the 1925, 1926 and 1927 tickets as does "E.V. Rickenbacker President" on the 1928. Rickenbacker also appears at the lower right corner of the 1928 general admission stubs as well. 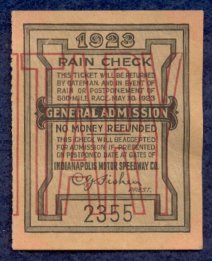 The 1929 grandstand ticket stub changes dramatically and looks more like the tickets we see today with a scene or picture on the front (in this case the front stretch stands, track and Pagoda) a diagram of the track on the back and a rain check at left. The design of tickets from 1929 through 1980 would feature some sort of racing scene be it a car or cars, car and driver, etc.. The size changes to 4 3/4” x 2 1/2” and the name of the ticket printer "The Arcus Ticket Co. Chicago" appears on the front for the first time at bottom center. The price is now on the stub portion of both grandstand and general admission tickets. Note the letter "A" has been punched in the ticket on the right side which corresponds to the stand. It is uncertain as to what circumstances a stub would be punched - were they punched upon initially entering the stand, leaving or coming back to the stand etc.. 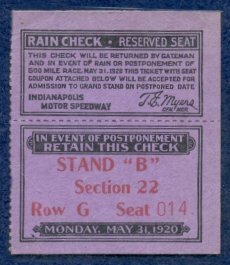 The Gate Admission (general admission) also changes and looks similar to a grandstand except it is smaller (2 2/5" x 4") and the rain check is on the right with "The Arcus Ticket Co. Chicago" printed vertically by the rain check perforation. There is a perforation at left where a gateman’s or admission stub probably was*. This is the only year known where general admission tickets are like this. A design also appears on the back of the general admission ticket for the first time. The signature of E.V. Rickenbacker President" appears at lower right center on both the grandstand and general admission stubs. The serial number is now absent. As with programs, tickets from this era are very hard to find. Sometime in the late 1970's or early 1980's, a number of unused 1926 and 1927 tickets were found. As the supply has dwindled, they have become more difficult to find. Besides the 1926 and 1927 unused tickets, if one had to choose, the 1929 is perhaps the easiest to find.